Back in the early 2004, Motorola was on a roll. Their product line was expanding in diversity with a range of promising handsets that marked Moto out as a serious challenger to Nokia’s dominance, and in March 2004 they launched a trio of “E” series handsets focussed on entertainment. The Motorola E1000 was perhaps the one that had the most market appeal – one of the few 3G phones on the market, the E1000 also came with a 2.3” QVGA display, 1.2 megapixel camera, video calling, expandable memory, multimedia playback, stereo speakers, Bluetooth and even GPS. Offering almost everything tech-savvy consumers could want the real problem it had was the lack of take-up of 3G devices at all, combined with restrictive practices such as Three’s “walled garden”. But even though the button-up-the side design was just a little bit weird, you have to remember that Nokia’s first widespread attempt at a 3G phone was the completely insane Nokia 7600. Capable though the E1000 was, one thing it wasn’t was a smartphone. 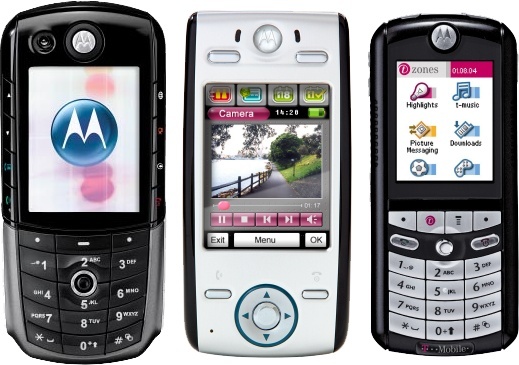 One of Motorola’s other offering at the time was the Motorola E680. This was a Linux-based touchscreen phone which fundamentally is what most people use 15 years later, except that the E680 had a 2.5” QVGA screen (tiny by modern standards) and no high-speed data of any sort. Despite having pretty strong gaming and multimedia capabilities, it was not a success. But then again, Nokia were also struggling to create the future with the Nokia 7700… which was also another weird device.